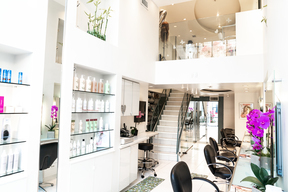 Jael BeverlyHills brings the best of Los Angeles and Beverly Hills together, offering exceptional hair services in a relaxed, chic setting. With our individualized approach to styling and color for both men and women, we excel in personalized attention and an inspired look. Our stylists take pride in creating looks that effortlessly fit your taste and lifestyle, while accentuating your natural beauty and maintaining the integrity of your hair. We are stylist specializes in haircuts, color Highlights Balayage - Ombre, Keratin Treatment. Our technique according to your hair type and facial structure—enhancing your complete image. Your stylist has worked his magic like a STAR! !